Chickens are raised for their meat, eggs or both. To cook chicken dishes, the ones raised for yielding meat are the best choice. Different dishes require chickens of different sizes and age. To cook "Sizzling Chicken", "Crispy Chicken" and "Stewed Tender Chicken", chicks several months old are used. To do "Stir-fried Chicken with Chili Sauce and Peanuts", "Spicy Shredded Chicken" and "Crispy Chicken", the meat from part of a chicken or a whole chicken of one year in age is called for. Chickens older than a year may be more nutritious and tasty, but the texture of its meat tends to be tougher and therefore not suitable for stir-frying. Usually such chickens are used either whole or in large pieces to be cooked or stewed with heavy seasonings. 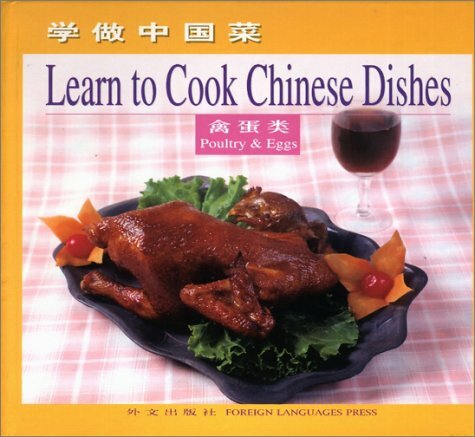 Examples include "Braised Chicken Chunks with Brown Sauce" and "Stewed Chicken with Gingko Fruit". Ducks range from those that are force-fed and those that are naturally fed. The first category are larger in size and their meat is tender and fat, making them ideal meat for duck dishes. They can be cooked whole to make "Roast Duck" and "Stewed Duck in Earthen Pot", or cut into chunks to make "Braised Duck with Green Tea". Alternatively, chunks of meat can be taken from the duck to make "Quick-fried Shredded Duck with Scallions" and "Braised Duck Slices". The naturally fed ducks yield both meat and eggs. Their meat is fine in texture and tasty. Such ducks can be cooked in whole or cut into chunks to make dishes such as "Crispy Duck" and "Duck Stewed in Clear Soup". View More In Cooking by Ingredient. If you have any questions about this product by Foreign Language Press, contact us by completing and submitting the form below. If you are looking for a specif part number, please include it with your message.